Why Are Lakhs of Protestors Heading for Delhi? 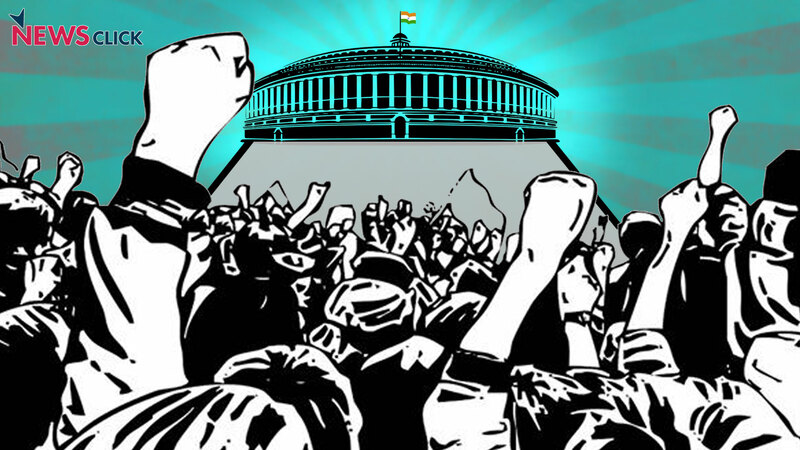 Hundreds of thousands of working people – workers, farmers and agricultural workers – are preparing to take part in a historic protest against the Modi govt. on 5 Sept.
For the first time ever, industrial workers, services sector employees, farmers and landless agricultural labourers from across the country will be holding a joint protest rally in Delhi. Their demands are straightforward: better living and working conditions, more jobs, land to the landless, end to dilution of labour laws and to privatisation of national assets, better prices for farm produce, universal pension, health and education opportunities, among others. The rally is being organised by the CITU, AIKS and AIAWU. But this is not merely a protest rally for settling some economic demands. The working people are also demanding that ‘neo-liberal policies’ pursued so relentlessly by the incumbent BJP govt. be reversed. The rally, in other words, is actually challenging the Modi govt.’s very raison d’etre. At a press conference on Friday, and in multiple programmes held as a build up to the rally, leaders of the three organisations have been criticising the very ‘anti-national’ character of the present govt. Their argument is that the Modi govt. has imposed policies that have pauperised practically the whole working people of the country, sold of national assets and resources to private companies (both foreign and domestic), compromised the security of the country by privatising even the defence sector and sowed toxic seeds of communal and casteist division among the people. All this is nothing short of being anti-national, the rally organisers assert. If the govt. refuses to listen to 99% of the population, and in fact, works against it, then it has no right to stay in power and must be defeated – this appears to be the political focus of the rally. Crucial State Assembly elections are going to be held in some of the BJP strongholds like Madhya Pradesh, Chhattisgarh and Rajasthan later this year. These will be followed by the general elections in 2019. The rally is thus a kind of curtain raiser for what the increasingly unpopular Modi govt. is going to face in the coming months. It represents the massive discontent simmering in the country at the inability of Modi to address joblessness, to ensure food for all, to provide for basic healthcare and education, to resolve the brutal agrarian crisis which has forced thousands of farmers to commit suicide and forced lakhs to stop farming and swarm urban areas in search of jobs. Thus, the two distinguishing features of this rally are: the coming together of three major classes in the country in a common struggle and the political demands raised by their united platform. The past four years have seen a steady deterioration of the living standards of the working people of India. Industrial and services sector wages have virtually stagnated. Job growth, which was already in doldrums during the preceding UPA regime, dipped further and in fact there were widespread job losses. The gap between farmers’ costs and the prices they got in markets widened. Agricultural labourers’ wages have stagnated and the number of days of work available to them has declined forcing many to migrate or undertake multiple ill-paying jobs just to survive. Meanwhile sky-rocketing prices of not only essential items like food but also of healthcare and education have either destroyed family budgets or deprived people of these basic rights. At the broader level, the suffering people have watched as a phalanx of billionaires have emerged as the favourites of the country’s Prime Minister and his close associates. They have cornered various lucrative deals, got their hands on some of the most prized and valuable national resources (oil & gas, telecom spectrum, coal, water, etc.) or assets (railways, transport sector, defence production, etc.). It is under their influence that the govt. has been rolling up its sleeves to get down to dismantling labour laws meant to protect the workers from greedy employers. Farmers in the country have watched with increasing horror as the promises made by Modi – that farm produce prices will be raised 50% more than the full cost price – have been turned into a hoax. People have seen with growing disgust and disillusionment the ever-increasing bad loans as the govt. allowed elite industrialists and diamond billionaires to skip out of the country with crores of rupees in their pockets. The working people of the country have also been witness to the all-round deterioration in the social and cultural fabric of the society as ruling party backed lynch mobs attacked poor cattle traders or others brutally killing them. In dozens of towns and cities communal tensions and violence has been engineered by provocative armed processions and slogans claiming to represent Hindu ethos but actually just being vote gathering dirty tactics. Dalits and adivasis, who make up the bulk of agricultural labourers and a substantial share of workers have been attacked and humiliated by the same type of upper-caste mob mentality. All this anger and resentment has been bursting out time and again in these years. There have been two massive nation-wide industrial strikes (in 2015 and 2016) followed by a mammoth sit-in (mahapadav) at Delhi in 2017, organised by a platform of ten trade unions. There have been sectoral strikes by coal, transport, plantation, scheme-workers, etc. There have been a series of movements by farmers across 13 states including the now famous Rajasthan struggle and the Kisan Long March in Maharashtra. Govt. employees, bank, insurance, defence, and many other public sector employees have struck work to demand better working conditions and end to privatisation. All these strands of struggles created a force that recognised the need to join hands with all struggling people. This is what resulted in the present call for the 5th Sept Rally. There has been huge response to the campaign undertaken by CITU, AIKS and AIAWU for the 5th September rally. District, block and village level meetings have been conducted across the country. Crores of leaflets have been distributed. District level jathas have been held in many states, despite the rains. Hundreds of thousands of people have participated in these programmes. Over 5 lakhs peasants and workers at around 600 places in over 400 districts the country participated in the ‘jail bharo’ programme at the district headquarters called by AIKS and supported by CITU and AIAWU. Around 1 lakh workers and peasants in 450 centres in more than 250 districts participated in the ‘samuhik jagaran’ called by CITU, on the night of 14th August. The 5th September rally is also being supported by eminent people in different fields like economists, artists, human rights activists etc. What Is Raj Thackeray up to in Maharashtra?